(NASCAR)—There’s no telling where Clint Bowyer might have finished at Martinsville this weekend if he hadn’t picked up two speeding penalties on pit road that dropped him back to the end of the pack on restarts. He rallied back to finish seventh after running in the top ten in both of the first two stages of the race. 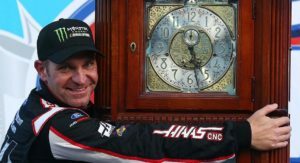 Bowyer was hoping to win his second grandfather’s clock, the traditional winner’s trophy at Martinsville, where NASCAR has run 141 NASCAR races beginning with Red Byron’s win in June, 1949. Bowyer broke a 190-race winless streak at Martinsville last year. Brad Keselowski turned in one of the most dominating performances in track history, leading 446 of the 500 laps on the .526-mile track. The record is held by Fred Lorenzen, who led 493 laps in the Fall race of 1964. Keselowski’s pit crew got him out ahead of Chase Elliott on the 380th lap. He held off Elliott, who led 49 of the other 54 laps in the race, finishing about a half-second ahead of Elliott and more than a full second ahead of Kyle Busch, who was making his 1,000th start in the top three NASCAR series’. It was Busch’s fifth top-three finish in the six races this year. The only other driver to lead any laps in the race was Joey Logano, who finished 19th. (INDYCAR)—Colton Herta has become the youngest IndyCar winner in the history of the sport. His car co-owner, George Steinbrenner IV is the youngest team owner in the sport today. 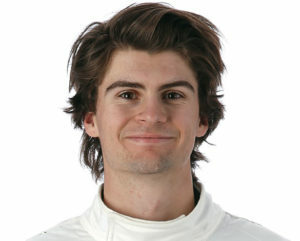 Herta, who is days away from his 19th birthday, drove a car co-owned by George Steinbrenner IV, who is 22. Steinbrenner is the grandson of the former owner of the New York Yankees. Herta took the lead when other drivers pitted as the race laps ran down. A broken axle sidelined pole-sitter Will Power, who had led the first 44 laps in IndyCar’s first race on the Circuit of The Americas near Austin, Texas. He beat Josef Newgarden on a restart with ten laps left and held him off to the end, winning by almost three seconds. The COTA race was only the third IndyCar race in Herta’s career. He’s the son of retired driver Bryan Herta, who owns another team. The previous youngest winning driver in IndyCar history, Graham Rahal—who was 19 in 2008—finished fourth, behind Ryan Hunter Reay. (FORMULA 1)—A shovelful of earth last week carried a startling reminder that the Vietnam War was a long time ago although the memories of thousands of Missourians who served there are still vivid. The company that designed the Circuit of the Americas race track on which IndyCar held its first-ever race this weekend has designed a 3.46-mile, 22 turn race track for the streets of Hanoi. The first Formula 1 Grand Prix of Vietnam will be held there next year. The track features a straightaway that is almost a mile long. Formula one resumes racing at Bahrain next weekend. It’s the second race on the 2019 schedule. United States-based Liberty Media, owners of Formula 1, will hold a meeting in London next week to talk about rules for the 2021 season—including a major change in revenue sharing, which is of vital interest to the lesser teams. Mikael McKenzie with the London Express reports the issue is so critical that Zak Brown of McLaren says his team might leave F1 if the new revenue sharing agreement does not provide enough money for teams other than Mercedes, Ferrari, and Red Bull to be competitive.